Today we have the perfect trivia app for all you food lovers out there. It is called Guess Food, and it is available for all Android users to enjoy. The app’s name is pretty straightforward. You have to guess the correct name of the food on your screen. There are tons of levels that you can unlock, each with gorgeous HD pictures of food from all over the world. You start out with one level, and you have to pick the correct letters in order to advance. There are empty tiles that indicate how much letters the food’s name has. If you are stuck on any particular food type, you can use hints to find out the food’s ingredients, as well as its place of origin. You can also gain additional coins by playing the video of the day. Coins can later be spent to reveal letters. So what are you waiting for? 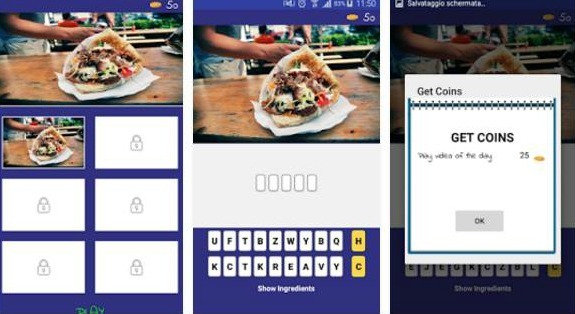 Download the Guess Food app and inspire yourself for your future meal at the same time! If you are interested, you can find and download the app on Google Play.